Floyd Mayweather Sr. has been telling the media the past few years that he may be retiring sooner than later. Upon the announcement of his son Floyd walking away from the sport this past September, following his victory over Andre Berto, Senior has been able to turn his attention to his upcoming crop of fighters. Mayweather Sr. works with undefeated prospects Andrew Tabiti (11-0, 10 KO’s) and LaDarius “Memphis” Miller (9-0, 1 KO), amongst others, and it is now the talent of a new young pupil who has caught his eye. 8-year old Curmel Moton continues to impress, both during his training inside of the Mayweather Boxing Club and nearby Pound 4 Pound Boxing Gym, as well as during his recent amateur showcases. 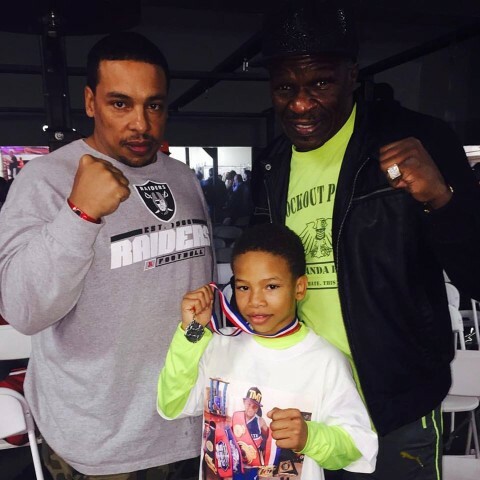 Earlier this month, Moton’s skills were on display yet again with Floyd Mayweather Sr. in his corner, as he captured a stoppage victory inside of Crossroads Boxing Gym in Ontario, Calif. Check below for a closer look at young Moton in action. Curmel Moton, Floyd Mayweather Sr.